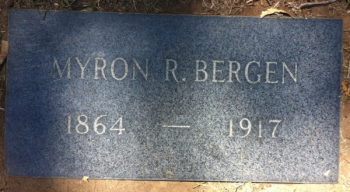 BERGEN, Myron Russell (c.1865-1917), Illinois-born married man who accidentally drowned at Pelican Bay, Santa Cruz Island on July 11, 1917 at the age of 52. His cremated remains are buried in the Santa Barbara Cemetery. 1904 Santa Barbara Directory: Bergen, Myron R., carpet cleaner, 20 West Carrillo. Home 535 E. Pedregosa. This page was last edited on 21 January 2016, at 10:36.